In a small saucepan melt butter, then, still on low heat, whisk in flour, which will hardly thicken it at all. Add lemon juice, and when the sauce curdles, which it will, add boiling water or stock by spoonfuls or in a small steady stream, whisking all the while, until the sauce sets and becomes smooth and homogeneous. This requires a steady hand but is essentially foolproof. The sauce should now be smooth and pale yellow, but stop adding liquid when it's still a bit too thick, as the fish will yield juices in baking which you want to add back to the sauce just before you serve it. At this point, add capers with a bit of their vinegar, SUPERB SEAFOOD Herbs and salt and pepper to taste. Keep pot on very low heat or water bath until the fish is ready, whisk in fish juices and serve with the fillets, garnished with fresh parsley. The perfect side dishes are a steamed vegetable and new potatoes. Homemade salad dressings are so much better than store-bought, and once you know how easy it is to make a great basic dressing, you might never buy one again! I always make a jarful since it keeps well and it’s so convenient to have on hand. Add while whisking: 1 cup of extra virgin olive oil. Allow to sit for a half hour to steep and set flavors; taste for salt and balance. Food Safety regulations for salad dressings and other bottled sauces require a high level of acidity to retard spoilage, resulting in sauces on the sour side. At home you can balance your salad dressings to suit your taste and the meal they will accompany: for example, more sugar (or honey) allows more acid and less oil, if you are watching fats. Mustard is an emulsifier allowing the ingredients to stay combined, if you incorporate it first, and it provides a tasty, salty base. Fresh garlic (never dried) adds sweetness and depth to any salad dressing. One of the healthiest of foods, Kale or other mixed cooking greens can accompany almost any meal, and they are amazingly quick and easy. Toss the kale in the melted oil. 1 Tbsp. SUPERB SEAFOOD herbs. Stir until the greens are wilted and hot, about 3 minutes. Chop them coarsely and serve. Beet greens are wonderful like this as well, use as a bed for roasted beets. Good Thyme Herb Blends are your partner in the adventure of color, fragrance, and savor. Good Thyme Herb Blends were created to make great seasoning quick and easy. 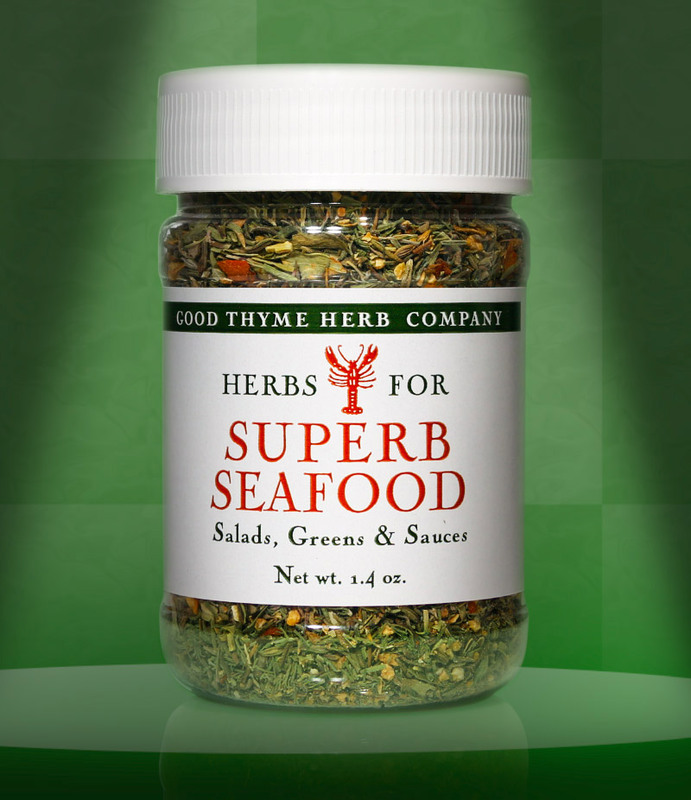 Good Thyme Herb Blends are seasoned performers, blended from experience and created for results. Your food is more than a statement of style; it's comfort, nourishment, and well-being. Season it right with Good Thyme Herb Blends. Call or e-mail us to swap recipes and ideas. Look for the free recipe on each product page.